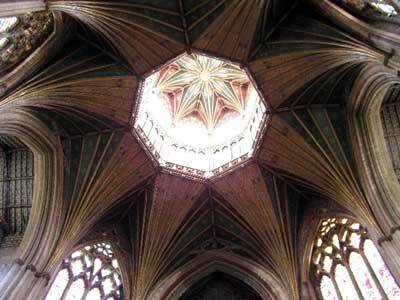 This photograph is of the interior of the lantern of Ely Cathedral, in Cambridgeshire, England. If you were standing in the crossing (the physical centre of the cathedral) and looked upwards, this is what you would see. It's sort of an enormous skylight. It was installed in the medieval era. Originally the cathedral had a central stone tower with a spire over the crossing, but it fell down. Cathedrals which look so eternal to us today actually had a history of bits falling off or falling down. The building materials are under huge strain and that makes them relatively fragile. Also the architects and masons who built them were experimenting all the time with new structural designs. In fact, Ely Cathedral, like many buildings of the type, has sections that have been built in differing styles, as tastes and knowledge changed over time. The monastic community who ran the cathedral at the time the central tower fell couldn't afford to replace it. So they came up with this octagonal confection of glass and painted oak to fill the massive hole in the roof of the cathedral. The lantern also allows more light to enter than the tower did. The paint was restored in the Victorian era. But the oak beams are original. I think the lantern is incredibly beautiful. Photographs don't do it justice because it's partly the setting that makes it so breathtaking. It's my favourite way of getting neck strain :) -- and I like it even more because it's a fix for a practical problem.